This innovative bottle may be the ultimate travel multitasker. The one-liter, TritanTM, BPA-free plastic bottle is perfect for carrying water, but its wide mouth also makes it an excellent water-tight container for your valuables, and the volume scale printed on the side makes it handy for mixing. 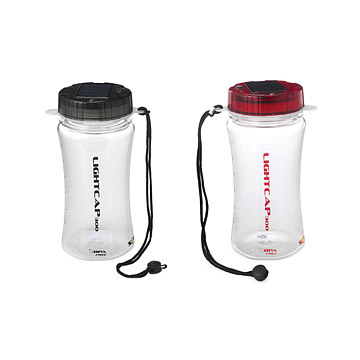 But the real twist is in the lid: sealed inside the cap are four super-bright LEDs and one red LED (for night vision), along with a reflective lens that turns your plastic bottle into a brilliant camp light. It's powered by a small, high efficiency FastSolarTM panel, so there are no batteries needed - ever! Features adjustable wrist or bag strap. Made in China. Available in red or smoke color. Click here to see it in use. Please note that the waterbottle needs to be fully-charged to emit the maximum amount of light. Care: Bottle is dishwasher safe. Cap is hand wash only. Great gift! 10 full hours to charge and 2 days of rain was a bit disappointing, but still useful in daytime until then! My friend hasn't seen it yet, so I'm excited to see if he likes it. I'm pretty sure he will. I'll let you know if he liked or didn't like this. It's great that you give us a chance to let you know. Your company is great. And I hope you have more U.S.A. products. This is important to me and probably many others. i would kindly want to thank you so much for being able to send me this wonderful solar lantern. you have sent us solar lanterns many times but this solar lantern water bottle is the best ever. because its not only made for light but also keeps water safe,i love its bright led lights because they give light up to eight hours, i also love its sensor because it gets off automatically when it gets to morning and gets on as soon as it gets dark. this is the only solar lantern which can make every one have a smile mostly to we here in Africa. kindly send my thanks to it,s maker. My husband is an avid outdoorsman - hunting, fishing, camping...you name it. He LOVES this waterbottle. Being out on the boat when the sun was setting, the light was perfect. He was amazed at how well it lit up the area. His friends have commented on how great this waterbottle is, too. This was purchased as a gift, so I cannot comment on it. I've not heard from the recipient as to their thoughts. I bought this for my dad, a former park ranger, who is always on an adventure. This bottle can be used to store items when on the water, it is also a light, and a water bottle. The light feature makes this a truly outstanding product. You will never be caught outside without a light when you use this water bottle! I got this for my sister who is planning an eight month long trip to Africa! She was very excited and it appeared to be a great travelers gift! Not only a water carrier but a lantern. My husband skis the back country so this is a back-up water bottle and light in case he gets stranded. This bottle is also great for kids' night light.